I previously tweeted that I was going to allow myself to read books for pleasure for the remainder of the summer without the pressure of writing reviews. Well, I loved this book so much that I had to make sure others know about it, too. Travis Stephenson has returned home after his first tour in Afghanistan. He would almost rather be back facing the Taliban. His former girlfriend is now dating his brother, his parents’ relationship has deteriorated, and he is having trouble leaving his battles behind. Travis was his Dad’s focus until Travis quit football. A former pro football player, Travis’ Dad had expected that Travis would go the same route. Instead, after high school graduation, Travis joins the Marines. The problem is that Travis sees Charlie everywhere, even though he knows Charlie didn’t make it out of Afghanistan. The guy that knew him better than anyone is gone. And Travis feels guilty for still being alive. All Travis wants to do is take his leave and return to his friends in the Marines. There’s nothing for him in Fort Myers…or is there? Even though a chance “reunion” with a girl from school nets him a black eye, Travis is enthralled with Harper Gray. Sure, he deserved the hit, mainly because he didn’t dispel the rumors about Harper in middle school that were started after they played seven minutes in heaven. Maybe Travis needs more than one second chance. Though I can’t remember how I found out about this book, I am so glad that I did. What a refreshing shift from young adult fantasy that I have been eagerly consuming over the past year. Plus, another change for me is it is written from a male perspective. To read something this real and heartfelt and heartbreaking was a real treat. This boy, so young, having to deal with so much – war, death, betrayal, the reality of his parents’ relationship. That’s a lot. But how does a person, who’s seen so much, deal with the life that was moving on without him? How does that person process what he’s seen and done in battle? How can he reconnect to home life? How can those people who love him help? I would have read this straight through last night, but sleep claimed me. I picked it up immediately upon awakening, so I had a nice cry before I even stepped foot out of bed. It was an eight-tissue cry, fyi. I was so sad for the death, happy that Travis found someone he could talk to, pained that Travis even had to deal with all this, and delighted that I got to read this story. If you or someone you care about needs any information regarding PTSD, contact the National Center for PTSD. 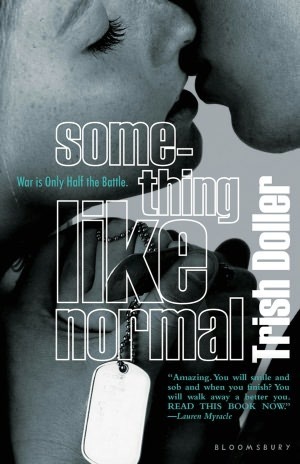 Something Like Normal by Trish Doller was published June 19, 2012 by Bloomsbury. @InkandPage So I needed a tissue for that review. Thank you. I really want to read this one. I’ve heard such amazing things, and I’m actually pretty obsessed with contemporary books that deal with tough issues, so it sounds perfect for me!